The scoring rubrics within the sample assessments are designed so that you can observe students during practice tasks, modified game play, fitness and movement activities, gymnastics or dance to determine their level of proficiency. With increased calls for accountability in public education and the shift to data-driven decision making, the role of assessment has evolved to take center stage in the education reform movement. 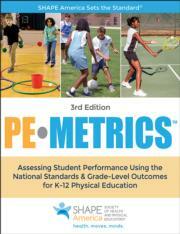 PE Metrics: Assessing Student Performance Using the National Standards & Grade-Level Outcomes for K-12 Physical Education, Third Edition, offers 130 K-12 assessments that were created by SHAPE America. These assessments align with SHAPE America’s National Standards and Grade-Level Outcomes for K-12 Physical Education and with its three PE lesson planning books. Learn to create your own assessments and measure student performance. PE Metrics: Assessing Student Performance Using the National Standards & Grade-Level Outcomes for K-12 Physical Education, Third Edition, aligns with SHAPE America’s National Standards and Grade-Level Outcomes for K-12 Physical Education, was created by SHAPE America and its writing team, and was reviewed by researchers and teachers with expertise in assessment. The result is a text that you can use with confidence as you help develop physical literacy in your students. PE Metrics, now in a four-color design, is organized into four main parts: Part I introduces the purpose and uses of assessment, how to develop an assessment plan, and the various types of assessments and tools you can use. Part II contains sample assessments for students in grades K-5, focusing on fundamental motor skills; as such, the elementary-level assessments center heavily on Standard 1. In part III, the emphasis shifts to middle school assessments, with a concentration on Standard 2 and on the categories of dance and rhythms, invasion games, net/wall games, fielding/striking games, outdoor pursuits, aquatics, and individual-performance activities. Part IV offers sample assessments for high school students, with a priority on providing evidence of the knowledge and skills students will need to remain active and fit after they leave high school. Resource for K-12 physical education teachers and administrators. Textbook for undergraduate physical education courses. SHAPE America—Society of Health and Physical Educators is the nation’s largest membership organization of health and physical education professionals. Since being founded in 1885, the organization has defined excellence in physical education, and its National Standards and Grade-Level Outcomes for K-12 Physical Education serve as the foundation for well-designed physical education programs across the country. SHAPE America provides programs and resources to support health and physical educators at every level and, through state and national advocacy efforts, works to make a positive impact on school health and physical education. SHAPE America has 50 state affiliates and is a founding partner of national initiatives such as the Presidential Youth Fitness Program, Active Schools, and the Jump Rope For Heart and Hoops For Heart programs.